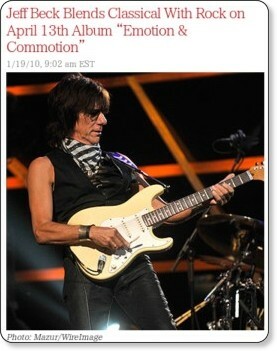 Jeff Beck Blends Classical With Rock on April 13th Album "Emotion & Commotion"
Jeff Buckley's "Corpus Christi Carol"
The Wizard of Oz's "Somewhere Over the Rainbow"
Screamin' Jay Hawkins' "I Put a Spell On You,"
featuring Joss Stone on vocals. Last week I went to LA to rehearse with a new band line up for my 2010 World Tour. I am thrilled to introduce the mighty Narada Michael Walden on drums. The astonishing Rhonda Smith on bass and with Jason Rebello on keyboards the sound is electrifying. 2010 looks set to be a good year and I can't wait to get on the road.